Here is one of the ornaments I made this year. I had made a sunflower ornament for my oldest son’s teacher, and the younger son wanted one for his. After thinking about, he remembered that she likes frogs. 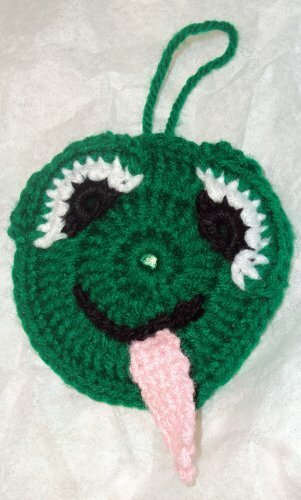 I couldn’t find a pattern for a frog ornament on the internet anywhere, so I came up with my own. It took me five days to complete, but that included figuring out how I wanted to do it, and I wasn’t working on it steadily. It would probably take less going from the pattern. I used items I had around the house. It’s a great way to repurpose used canning lids. If you don’t have a canning lid, you could use a CD, but you’d have to make the front and back a couple rows bigger. I suppose you could also you a sturdy cardboard circle. With green and F hook, ch 4, join to form loop. Ch 4, join to form loop. With black, ch 4, join to form loop. Row 1 - Sl st in loop. Ch 1. 6 sc in loop. Fasten off. Row 2 - Join white yarn with sl st. Ch 1. Sc in same st. *2 sc in next st. Rep from * to end. Fasten off. Row 3 - Join green yarn with sl st. Ch 1. *Sc in next st. Rep from * to end. Fasten off. With pink and D hook, ch 5. Row 1 - Sc in 2nd ch from hook. Sc in each ch to end, turn. Rows 2-10 - Ch 1. Sc in each st to end, turn. Row 11 - Ch 1. Sc tog first two st. Sc next two st, turn. Row 12 - Ch 1. Sc tog st. Fasten off. With green yarn and working in back loops of last row, attach eyes to top edge of front with sl st.
With black yarn, sl st around posts of 2nd round, joining starting ch of tongue, to form smile. Attach a loop of green yarn to the back between the eyes to form hanger. Sl st front and back together with green yarn. About halfway around, insert canning lid and continue to sl st around lid. Copyright © 2009 by Camilla North of KS. All rights reserved.